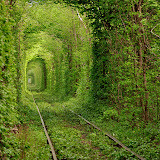 There are times when things come together perfectly for a teacher. I had one of those moments the other day, and, like many things I tend to write about, only other teachers seem to understand the kick I get out of it. Years before I was ever a teacher, or even thinking of teaching, I worked flipping burgers, a job that is often looked down upon. I learned to make a really nice burger and the value of hard work, but other than that, I didn’t know how to apply those skills to my current teaching job. Until, that is, I had to teach compound, complex, and compound-complex sentences. In the middle of a dry textbook lesson on sentences, I was looking for some sort of analogy that related to our subject and then it hit me: A simple sentence is like a plain burger. It’s an independent clause without any flavor: edible, but boring. 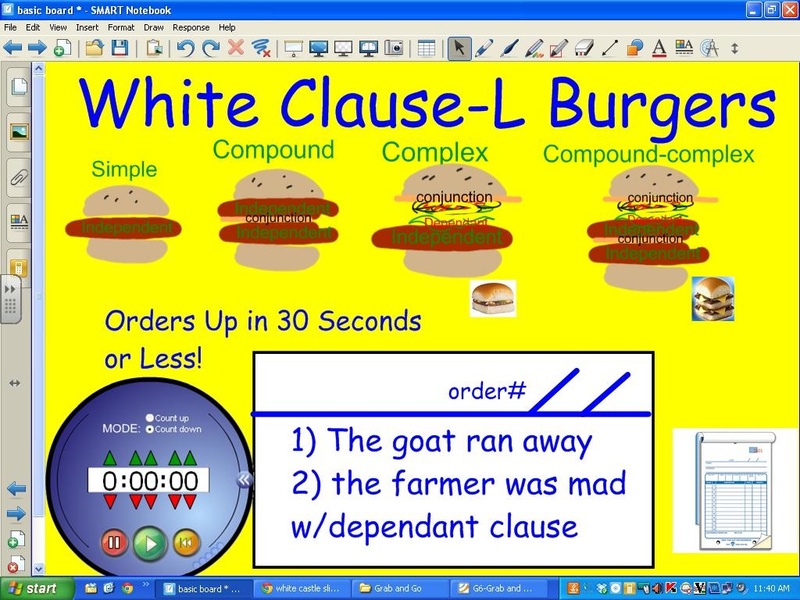 Add another patty and some conjunctions/cheese to bind them together and you get a more interesting sentence/burger. Finally, dependent clauses, the condiments of the grammar world, add flavor and meaning to an existing sentence/burger but cannot be spoken/eaten by themselves. It all came together mid-lesson. 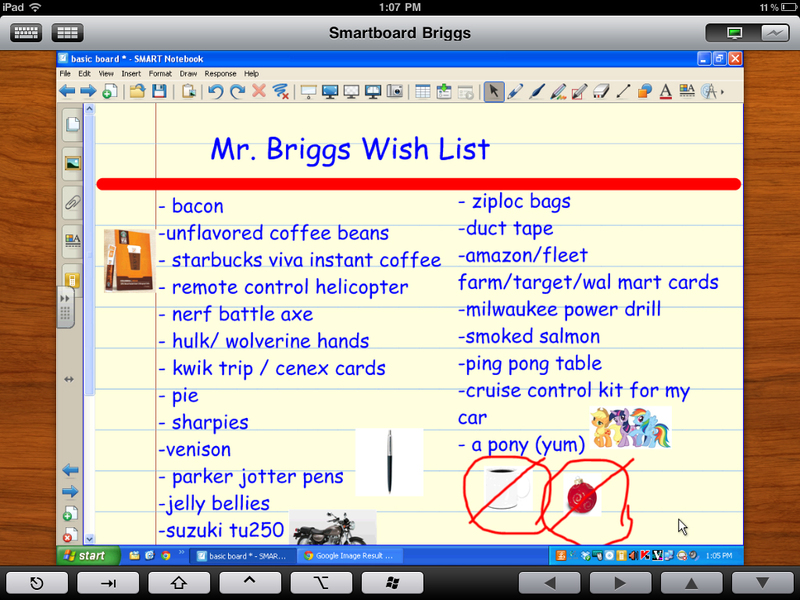 With the SMARTboard I was able to make a fantastic manipulative on the fly for my students to use and reference. Nearly every student aced his or her grammar test this week, and we celebrated with—what else—White Castle cheeseburgers. My fellow teachers! No more will I be a slave to the copy machine! Today I declare my independence from the daily ritual of lining up behind the beige, beeping monstrosity with blackline masters in hand! Today I took my fancy box of student handout masters, tore the bindings out of them, and stuffed them through the business end of said copier and set it for scan instead of copy. I spent the whole morning feeding the machine my masters. Sure, I had to unclog it a few times, but at the end of the morning all 30 weeks of my reading program were rendered into fancy, organized PDFs, now living happily on the cloud within my Dropbox. Why scan all these in? Mostly to save time, to prevent having my eggs in one basket and hopefully allow me to be more versatile with how I can distribute my homework. Instead of having to spend time leafing through my book, figuring out the settings on the copier and barring access to the copier for my co-workers, I can now send the pages I want from my computer. (A trick accomplished by separating the pages with commas: for example, if I only want pages 5, 24, and 6 I tell the printer I want pages 5,24,6) Instead of having a single copy of my masters, through the magic of the cloud I have them at home on my iPad and on my SMARTboard at work. I can never lose the digital copy (hopefully) or have it damaged though a coffee spill or a hungry dog. If a student is absent, I can shoot them a PDF from my desk since I already have it on my computer. If I have an emergency, I can access the files I need from home and create a packet to send to my sub. Would I replace my books for a digital edition? No. I like to have book to thumb through and mark up with sticky notes. But it helps to have a digital edition as well, since the act of printing and presenting can be hard on their binding. I hope that as ebooks and digital editions of textbooks become more common that more books include digital versions with their print materials. Then I don’t have to spend so many mornings wrestling with the great beige beast. There are times when a single-use item is best, and wrapping it up in other products is a bad idea. For example, take the scanner. Time was there used to be a variety of flat-bed scanners out there, and while they were hard to use, they performed an important task: to change paper hard copies into digital ones. Sadly, the humble scanner was a clunky thing and took up a lot of desk space. Now scanners are more often seen attached to all-in-one inkjet printers as an afterthought since most consumers no longer use them for scanning in photos and don’t bother scanning in documents. As a teacher, I love scanners. I love to get my student’s work on a computer either to make a record of it, pass it on to a colleague or parent, or to pop it up on my SmartBoard. Part of my teaching routine is to go to the staff room and wrangle with the massive copier’s scanner function in order to make a PDF ‘overhead’ I can actually use since most of my teacher materials still come in the form of a bound, blackline master books. Sure, there are overhead options—for example, document cameras such as the ELMO—but they tend to be expensive, take up valuable desk space, and lack the ability to digitally share the document or mark it up. The VuPoint Magic Wand, scanning. 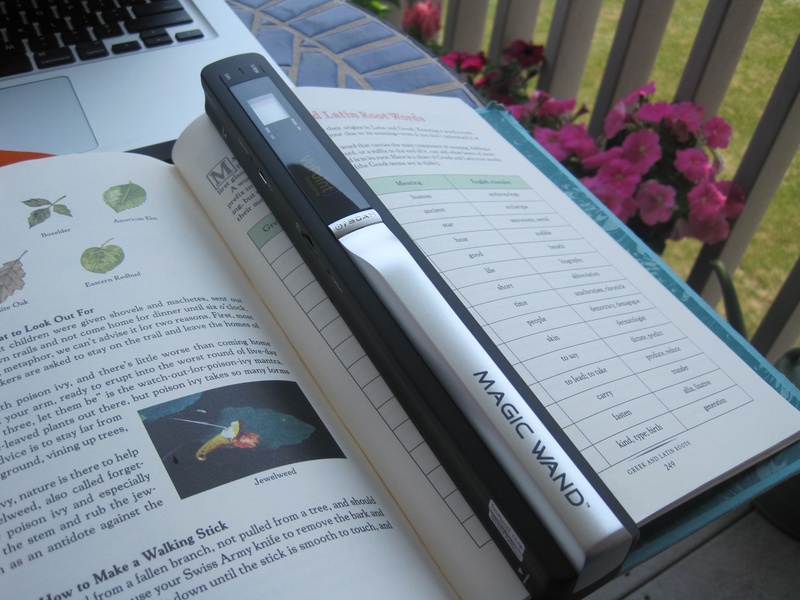 Enter my newest toy and salvation: the VuPoint ‘Magic Wand’ scanner. It’s a foot-long rod that runs on two AA batteries and allows me to scan documents by simply passing it over a page. No clunky flat-bed, no waiting for it to ‘warm up’ or messing around with software, just pass it over your document and the image is popped onto a microSD card. I see myself spending a day before school starts scanning through all my textbooks and overheads so that they will be ready for my SmartBoard. I see myself passing this around to students so that they can share their work either on my whiteboard or via my online classroom. I finally have an easy, child-proof method of converting written work to digital work.